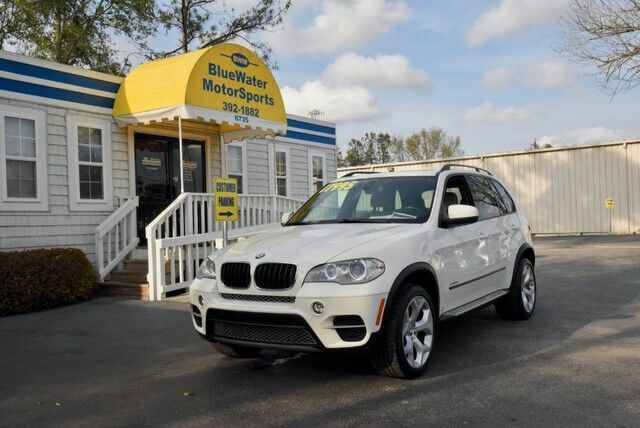 Blue Water Motor Sports has a wide selection of exceptional pre-owned vehicles to choose from, including this 2012 BMW X5. This 2012 BMW X5 comes with a CARFAX Buyback Guarantee, which means you can buy with certainty. Do so much more with one vehicle. This BMW X5 gives you everything you need an automobile to be. Put performance, safety, beauty, sophistication and all the right amenities into a car, and here it is! Now you can own luxury without the luxury price tag! Navigate through all the icky weather with ease in this AWD-equipped BMW X5, and even get non-stop traction for your non-stop lifestyle! In addition to the amazing traction control, you may even qualify for an insurance reduction with this AWD vehicle. One of the best things about this BMW X5 is that it has low, low mileage. It's ready for you to truly break it in. Added comfort with contemporary style is the leather interior to heighten the quality and craftsmanship for the BMW X5 This gently driven vehicle has been well-kept and still has the showroom shine. Treat yourself to a wonderful driving experience in this wel- optioned BMW X5 35i Sport Activity. Equipped with the latest in driver comforts, this BMW is the benchmark of modern automotive engineering. Put away your phone and focus on the road, your new vehicle has navigation. More information about the 2012 BMW X5: BMW's X5 offers seating for seven with high-tech on- and off-road capabilities. And with all-new styling as well as a host of refinements for 2011, the package has become even tighter. Although it ranks among the more expensive SUVs in its class, it's a strong competitor, offering a wide range of options not found on the Acura MDX, Lexus RX 350 or Mercedes-Benz M-class. Strengths of this model include BMW luxury and build quality, standard all-wheel drive, new more powerful engines.